Researchers at the University of California, San Diego are reaching across disciplines to push the envelope of cultural and learning opportunities in the age of social networking and digital media. They have established a new Center for Research in Entertainment and Learning (CREL). It will focus on grassroots creativity and learning while promoting research that combines artificial intelligence with interactive and participatory media to allow people to be more creative, informed and make better decisions in educational as well as entertainment environments. CREL is housed within the UCSD Division of the California Institute for Telecommunications and Information Technology (Calit2). "The rise of the Internet, the Web, digital media and social networking environments introduces new methods for the creation of educational and cultural content," said CREL founding director Shlomo Dubnov, a professor in the UCSD Department of Music. "We are witnessing the emergence of new amateur practices and innovative designs in which multiple users collaborate, produce, annotate and re-use shared multimedia content." Research and development in the new center will use advanced IT technologies to help people deal with meaning in complex situations, such as questions that arise during story narratives, from films to business situations. And of course understanding how music sets the mood and frames expression is an indispensable part of this research. So by combining Semantic Web platforms with analytics and data mining, annotation, visualization, sentiment and emotion analysis, and making it all ubiquitous via mobile technologies, digital media and design, CREL intends to reach out to industry, including the many companies in California that are transforming digital media. 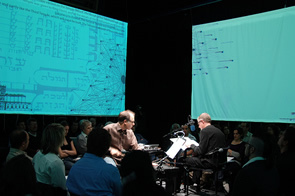 Audience members use their laptop to participate in an online chat that is integrated into Shomo Dubnov's Kamza and Bar Kamza, performed here in UCSD's Loft. "Calit2 has a mandate to help keep California on the bleeding edge of innovation in order to ensure that the state is able to create the next Silicon Valley or the next wireless hub," said Ramesh Rao, director of the UCSD division of Calit2. "This is critical to future economic growth and jobs in California, and we are hopeful that CREL will be able to engage with industry partners to ensure that our research breakthroughs translate into technologies for tomorrow's marketplace." The new center will support pre-doctoral and post-doctoral fellows, enable undergraduate and graduate students to connect research with their campus courses, and provide infrastructure for collaborative grant writing and research. "The rising interest in service learning, or creating environments for discovery-based curricula, might provide a timely response also to the crisis in funding for education," observed Dubnov, pointing to CREL's broader potential impact. Membership in CREL is open to UCSD faculty and affiliated members interested in building a digitally mediated society. In addition to CREL director Dubnov and Calit2's Rao, founding UCSD faculty participants in the new center include communication professor Morana Alac, psychology professor Diana Deutsch, as well as cognitive scientists Richard Belew and David Kirsh, all from the Division of Social Sciences; Natasha Balac and Chaitanya Baru from the San Diego Supercomputer Center; music professor David Borgo from the Division of Arts & Humanities; Philip Bourne, School of Pharmacy/Pharmacological Science; computer scientists Charles Elkan and Thomas Powell from the Jacobs School of Engineering; and affiliated member computer scientist Fionn Murtagh from Royal Holloway, University of London and ICT Science Foundation Ireland. UCSD music professors -- percussionist Steven Schick and vocalist Phil Larson -- are surrounded by the audience while interactive chat and commentary play out on four large screens surrounding the audience. 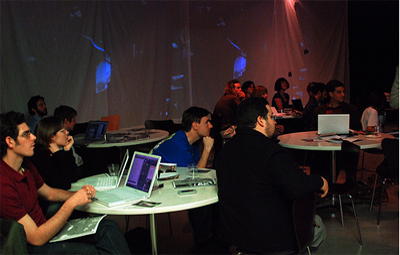 The unique interdisciplinary nature of the center will permit a systemic look into novel methods of participatory media (i.e., involving group interaction). These methods will include ways to leverage audience back-channeling, crowd-sourcing and distributed moderation techniques for engaging the public in meaningful interaction with artists and educators. Dubnov also notes that CREL will reach out to companies and communities that use the Internet and digital media, because they can benefit from the research to get their message across or to get feedback from their users or customers. The new Center for Research in Entertainment and Learning will be housed in Calit2, which will provide the infrastructure and administrative capabilities to manage the establishment of CREL. "We also plan to work with different UCSD divisions and colleges in developing participatory and collaborative learning programs for students," said Dubnov. "We will also establish research collaborations with other research centers on campus which engage in social, educational and creative use of digital media technologies." According to Dubnov, "CREL will also promote the integration of the center's interdisciplinary research into the arts, entertainment and classroom programs." External collaboration and support are expected from Centre for Computer-Supported Narrative and Semantics, IEEE Computer Science Technical Committee on Computer Generated Music (IEEE CS TC on CGM), which provides know-how of Standard IEEE 1599 (for multi-layered representation of information in music, and multi-media in general); Multi-Database and Multimedia Database Group of Keio University (Shonnan Fujisawa Campus, Japan); the Institute for Research and Innovation (IRI) of the Centre Pompidou (Paris, France); and the Institute for Research and Coordination in Acoustics and Music (IRCAM) (Paris, France); and Web development agency, PINT.com.